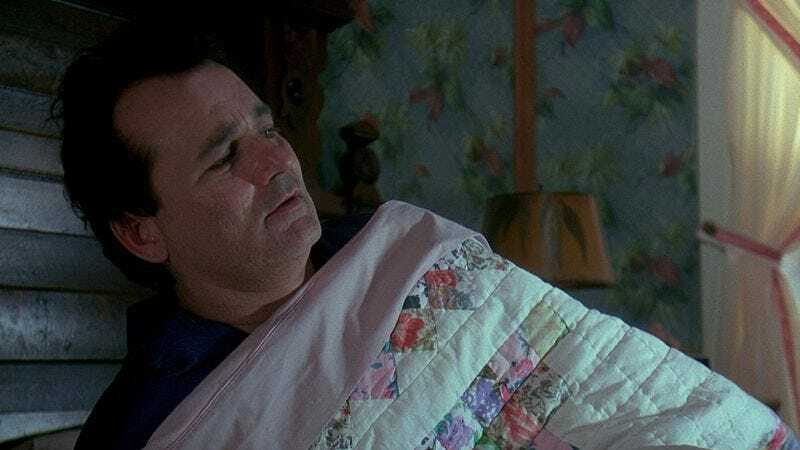 Harold Ramis and Bill Murray’s 1993 comedy Groundhog Day has by this point transcended mere cinema, having been embraced by spiritual types for its moral absolution and even folded into the lexicon—to say something feels like “Groundhog Day” is to imply you’re caught in an endless cycle. It makes sense, as its story of Phil—a Philadelphia weatherman who, while covering the fabled Punxsutawney groundhog, relives the same day over and over again until he achieves his own personal zen—still feels resonant 25 years after its release. To celebrate, editor Neil Fennell, in his words, “wanted to see what it would be like if the events of the movie Groundhog Day all took place simultaneously.” Fan theories clock Phil’s journey at anywhere from eight to 34 years, but Fennell limited his focus to the 37 separate days shown in the film. Then he synced up each individual moment or meeting, such as Phil’s numerous spats with Ned Ryerson and his tragic encounters with the ill-fated homeless man. The result is kaleidoscopic and illuminating, a testament to the script’s nuance as well as the depth and range of Murray’s performance. The edit’s 30-minute runtime will eventually start boggling the mind, but there’s a distinct joy in watching these characters live out these alternate realities side by side. The Ryerson moments, in particular, are a cacophony of sound and shtick. Still, no matter how many realities we see, Chris Elliott’s hapless cameraman never gets a happy ending.